Have secretive TIF accounts played a significant role in the underfunding of Chicago pension funds? A new report out today, Putting Municipal Pension Costs in Context: Chicago, focuses on how Tax Increment Financing or TIF seems to be undermining the city’s budget and has been for the last decade. At a moment when politicians are talking about cutting retirement benefits for civil servants like Teachers, Firefighters, and Policemen, we think it’s useful to remind the public about what’s been dubbed Chicago’s Shadow Budget, none other than TIF. There’s been no shortage of troubling issues surrounding TIF. We’ve blogged about them a number of times on this blog. Nearly one out of every ten property tax dollars collected in Chicago doesn’t end up in the city’s general fund or with other taxing jurisdictions that provide public services. Instead, those revenues are siphoned off into what were once secret TIF accounts controlled almost exclusively by the Mayor. While this report does not specifically call for the abolition of TIF in Chicago or oppose taking other measures to raise the needed revenues to pay for critical public services, we believe that as a matter of honest accounting and fair budgeting, TIF requires careful consideration. TIF costs have grown significantly in recent years. They have for years exceeded the City’s annual pension liability. Our analysis shows that property tax diversions into TIF have exceeded pension costs in every year since 2007. For example, the city’s pension costs were about $386 million in 2012, while TIF diverted $457 million in property tax revenues in that same year. When newly elected Mayor Rahm Emanuel took office, he convened a TIF review process in order to fix this so-called Shadow Budget. Although the City made TIF far more transparent as a result, the review did not make TIF any less corrosive towards Chicago’s budget. Recent new rounds of proposed subsidies for things like basketball stadiums and hotels raise serious doubts about whether TIF reform has actually materialized. Aides to Mayor Emanuel have acknowledged that about $1.7 billion sits in TIF accounts, though $1.5 billion is obligated to various projects through 2017. But if the city is willing to consider breaking pension commitments, why should TIF spending not receive similar scrutiny? Indeed, in California, Governor Jerry Brown didn’t rule out TIF spending to shore up budgets. Much like in Chicago, TIF in California was siphoning off an enormous amount of property tax revenue: 12 percent overall. When efforts to reform California TIFs failed, the state dissolved the authority of localities to have TIF districts and began the process of unwinding the existing debt obligations. In the long run, local jurisdictions in California will see a 10 to 15 percent increase in property tax revenues over what they would have had with TIF still in effect. 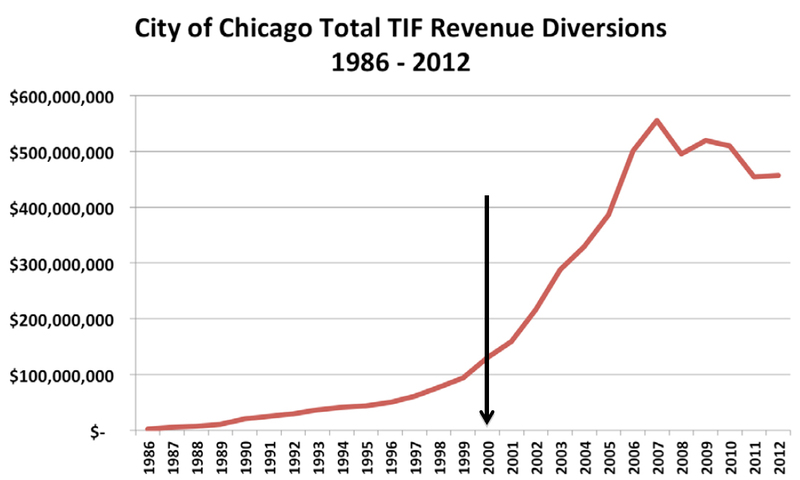 Over the past decade or so, observers have noted that the City of Chicago had a revenue problem, but rarely have they noted the corrosive nature of TIF spending. According to a 2010 report on pensions issued under the previous Mayor of Chicago, pension funds began running into issues after the year 2000. It was during this period that the city began making what the report dubbed “inadequate contributions” to pensions. Is it a coincidence that property tax revenues lost to TIF more than doubled between 2000 and 2003 and quadrupled by 2007 to exceed half a billion dollars a year? 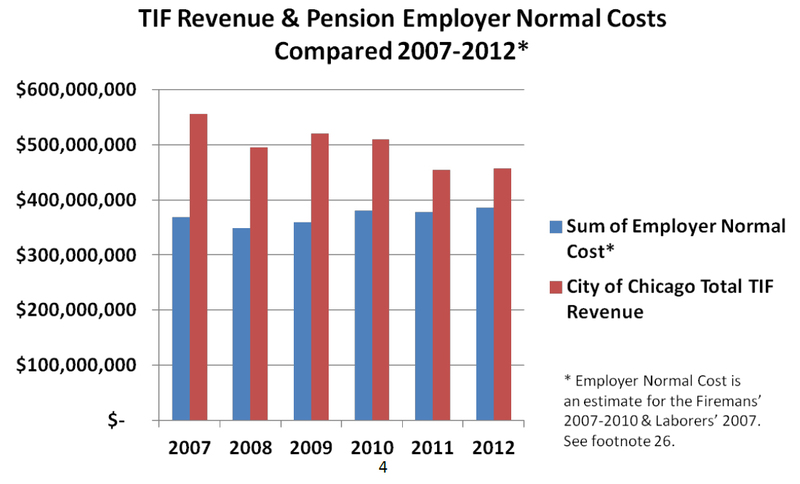 It’s hard to ignore the evidence that TIF impacted pensions: TIF costs grew, general fund revenues declined, and the city addressed its budget gap in part by making inadequate contributions to public pensions. Cutting back on TIF in Chicago can and should play a role in shoring up the city’s financial situation. Coverage of the report can be found at The Chicago Sun-Times & at PandoDaily. Good Jobs First is a non-profit, non-partisan research center focusing on economic development accountability. It is based in Washington, DC. This entry was posted on April 4, 2014 at 2:40 pm and is filed under Illinois, Subsidies, Tax Increment Financing, Taxes. You can follow any responses to this entry through the RSS 2.0 feed. You can leave a response, or trackback from your own site.